JamesA: Okay, I'll play White here. I'm 1k (for your records!). 2 - Star point - nice quick development. When Black plays on the 3-4 point I like to play the opposite star point. It leaves a good play at a for later, and if white approaches the top left star point I think it will be OK for White to play at b. 4 - I would like to invite Black to enter the left side, with the hope of using the power of my star point down that side. Also, I would like to play c if possible, which may make a wariuchi on the left side irresistible for Black. Again, my aim is to use the top left star point to fight. I've gone for the 3-5 rather than the 4-5 as Black's stone 3 is on the third line. 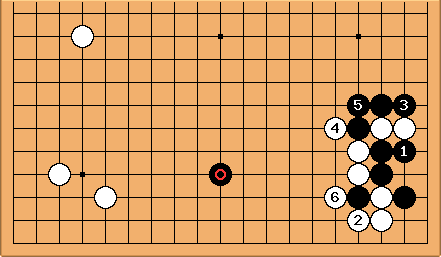 I would often play on the lower left star point in this position, but I want to try to get control of the game if possible. 6 - Lots of things to think about for this move. First, if I go with the original plan and play at b I anticipate the following sequence. White's top left position doesn't seem to work well with the 5-3 stone in the bottom left. 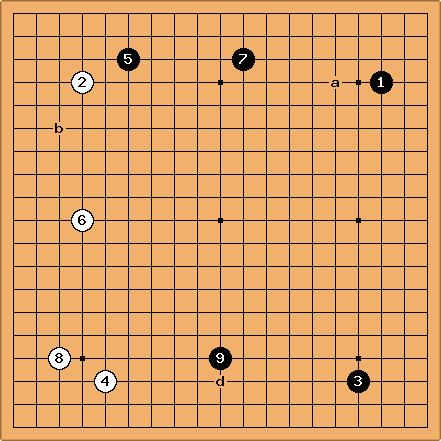 However, White gets sente to approach the bottom right, or make a shimari in the bottom left. I would definitely approach the bottom right, otherwise White is concentrated on just one side. Also, there doesn't seem to be a good way in for White to the top right now. I quite liked this result as White has great influence. However, Black has sente, and there are important plays to be made in the other three corners. Also, I'm not certain that Black would follow this sequence. How about this alternative? Then Black can make a shimari in the lower right as a ladder breaker. I don't want to be in a position not to be able to answer a black shimari with a play on the lower side. I thought about leaving the top left and approaching either the top right or the bottom right. However, I expect a double kakari to follow, and I think this would seriously undermine my right side. I don't want my star point stone to look weak. Also, I'm regarding plays in the top and bottom right as miai. I think that (depending on joseki played I guess...) White will get to approach one and Black will make a shimari in the other. I don't think it matters whether White approaches before or after Black completes one of his shimari. Does that make any sense? I considered playing a pincer in the top left, but again I'm worried about a double kakari to wreck my left side. Basically, I want to look after my own position at this point. I thought that the move 6 played offered support to the top left, should Black make a second approach, and offers support to the bottom left, making it less attractive for Black to enter there. 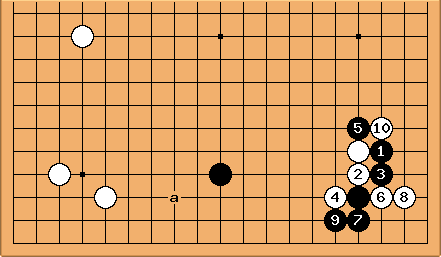 8 - This makes a shimari with an extension - a position that black will more often than not prevent if the shimari is played first. Black's top position is low so I am not too worried about the speed of black's development - I think White has time to build his own position still. If Black now makes a shimari in the bottom right I will play at d and make an ideal double wing formation, whilst at the same time preventing an extension from Black's shimari. Assuming Black doesn't play this, I will probably approach Black's bottom right as soon as possible. 10 - I think this is a very important moment, and I will consider several options to try to work out which I think it best. Of course, my first instinct is to play at a or b to prevent Black getting an extension from a shimari in the bottom right, but I don't want to rule out other possibilities. Black has played 9 on the fourth line. 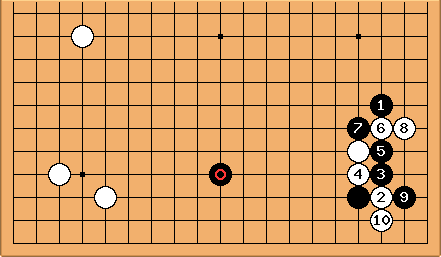 This means that if Black makes a shimari in the bottom right, White can probably scoop out the territory here at some point. Perhaps a play two lines under 9 would do this. The timing is important though - Black would undoubtedly build thickness facing the right side, so White has to be careful about relying on this invasion. A second black approach to the top left stone is big. White would like to prevent this if possible. Black's stones 5 and 7 are one space too far apart to be connected. Therefore it may be possible for White to threaten to invade here. 5 and 7 are on the third line, therefore Black is not building on a big scale at the top. 9 is on the fourth line, so Black may start building on a large scale on the right or the bottom. In particular, I think a play one to the left of f would be very big for Black. White would like to play at f if possible, to pre-empt this and threaten to invade at the bottom. Lastly, there are still two places in which White can play a kakari. Because of Black 9, though, I think a kakari in the bottom left is preferable. OK, first there is the approach to the bottom right with a or b. I'm immediately loath to play b, as a black pincer would make a shimari play from Black in the top right good, whilst enabling Black to make territory on the lower side. As 9 is high, I suspect that might help Black if I approach low. After which Black's marked stone looks a bit forlorn. Alternatively, and more probably, I would expect Black to attach. I would then be tempted to play the avalanche, after which a white play at a will be tempting again. I figure White is more likely to get to play here first as there are very big moves in the top left, which Black will want to get to before White. I think a play at c is too small at the moment, and dives into Black's area too early. A play at f would be quite solid, but too slow, I think, as Black could play again on the right side (shimari bottom right?) and I think it will be difficult for White to enter the right. What I'm most tempted by is a play at d or 10. I would like to use the power of my top left star point, but I need a play that Black will have to answer. I think a white play next at c would be quite nasty for Black, and I suspect he will answer, probably by jumping out. If I can, I would like to engineer the fight that follows to eventually make miai of plays in the top and bottom right.